Why Use a Wimberley Replacement Foot? A replacement foot replaces the factory tripod mounting foot on your lens. A Wimberley replacement foot is an Arca-Swiss style quick-release plate that mounts to a lens rotation collar where the factory foot used to be, and can be used either to mount the lens to an Arca-Swiss style quick-release clamp, such as a Wimberley C-12 clamp, or onto a single tripod or monopod mounting screw. The reason we make a replacement foot for specific lenses and not others is because certain lenses need a reduction in the lens profile (height from foot to lens barrel) to balance properly when mounted on the Wimberley Sidekick or, in a few cases, on the Wimberley Head. This reduction in the lens profile can also be helpful when packing your equipment, mounting a lens directly on a tripod or monopod, when shooting from a car window, or using the lens on a beanbag. Other lenses do not need the reduction in profile to balance, so a regular lens plate is recommended for mounting. For some lenses, the replacement foot reduces the space between the foot and the lens barrel so much that there is no room to get your hand between them to use the foot as a carrying handle. This function was not a primary consideration for this product, thus this is a sacrifice that must be made for the proper function of the lens on the Sidekick or Wimberley Head. Also, on certain lenses the replacement foot may interfere with reversing the lens hood for storage. Again, this sacrifice must be made to enjoy the benefits of proper balance. We regret that alternate arrangements for carrying and storing your lens may have to be made in these cases. Other manufacturers make lens replacement feet primarily to offer an option for weight savings as well as reduced height. You may be able to use another manufacturer’s replacement foot successfully with our heads. However these replacement feet are not as robust as Wimberley replacement feet and may introduce flex, which may be noticeable as soft images especially at longer focal lengths. This is more likely when using a side-mount orientation support such as the Sidekick. Unfortunately we are a small company and do not have the resources to devote to researching each and every competitor’s product to see if they are compatible with our gimbal heads. Our replacement feet are designed to a specific strength and length to allow you to achieve optimal balance, and thus optimum product performance, on our gimbal heads. Other manufacturers do not design their plates and replacement feet products with this specific purpose in mind; therefore we cannot guarantee that a Kirk, Really Right Stuff (RRS), or 4th Generation design replacement foot or lens plate will work properly with our gimbal heads. Our replacement feet will have adequate length and height reduction to put the lens in the proper position for balance and will be robust enough to greatly reduce flex when used with our Sidekick and Wimberley Gimbal Head. You can certainly try another manufacturer’s replacement foot to see if it will work with our heads; however, the foot may not have enough length for proper adjustment, or may not reduce the profile of the lens enough, for proper balance especially on the Sidekick. In addition, another brand foot may not be robust enough for a side-mount application to prevent flex and you may sacrifice image quality because of it. We do not dispute the fact that RRS makes very nice plates. They deserve the fine reputation that they have earned. Kirk Enterprises also makes nice equipment. The replacement feet made by 4th Generation Designs are hollowed out thus reducing their weight, but this also reduces the robustness and stability of the foot itself. In designing all of our plates, we made every effort to match the quality of construction found in RRS plates while adding the following unique features. Wimberley introduced the dual safety stop feature that is now becoming an industry standard for Arca-Swiss style quick-release plates, and this safety feature has made our plates very popular. We have many customers who have switched to our plates for this feature alone. Wimberley lens plates have always come with safety stops at the front and back of the plate. These safety stops prevent your lens from accidentally slipping out of the quick release clamp in either direction. Furthermore, when used with Wimberley clamps, our plates offer significantly more forward and backward movement when using the stops than other clamps having grooves either too shallow or too deep to work effectively with our stops, or no grooves at all. Wimberley plates are long enough so that there is enough distance between the two stop screws to straddle the length of most quick release clamps. However, the stop screws do limit the amount of forward-backward adjustment that you have if they are used with a quick-release clamp without channels of sufficient depth. Wimberley C-12 quick-release clamps solve this problem. Our clamps have channels that go almost to the center of the clamp. The channels allow full range of fore and aft motion but will not let the plate slip out. RRS and Kirk decided to make quick-release clamps with grooves compatible with our stop screws, and eventually followed our lead in offering their quick-release plates with stop screws as well. Initially their plates only had one safety stop at the back of the plate; this prevented the plate from slipping out of the quick release clamp in one direction only. We are pleased to see that they have recently added dual stops for safety on most plates; however, to our knowledge, RRS and Kirk L-brackets, and Kirk replacement collar/foot quick-release plates, do not offer the safety stop feature as of this printing. Note: If you opt to use both stops you must open the jaws of the quick release wide enough to load your lens from the top (instead of sliding it in). Top loading is a little less convenient, but if you use both stops you will be completely certain that your lens will not slide out of the clamp, and it really only takes a few seconds to open the clamp wide enough to accommodate the full width of the plate. You may need to use a longer plate than normally recommended in this situation. If you elect not to use one or both of the stops, they can be removed with the hex keys provided. Arca-Swiss Z1 users: The safety-stop security feature of our plates does not work when used with the Arca-Swiss "double-decker" screw-knob quick-release or lever-release (flip-lock) clamp. We recommend replacing the double-decker clamp with our C-12 modified clamp, or ordering the Z1 ball head without a quick-release clamp and installing our C-12, if this safety feature is important to you. Please contact us for details. Feature 2: Increased versatility when using current and older flash brackets. Wimberley replacement feet have always had a double-dovetail design which allows you to mount our quick-release flash bracket either on the top or the bottom of the plate as needed. Kirk, RRS and others have followed suit, but not all their plates have a double-dovetail groove, or have a rounded plate surface, and this restricts bracket mounting options. Older RRS and Kirk lens plates have holes in them to accept older, non-quick-release flash brackets. These older flash brackets are nicely made, but can be frustrating to mount because they attach with loose screws and required a special tool (both of which are easy to lose). Another source of frustration is that these older RRS flash brackets were designed to work only with RRS plates and the Kirk flash brackets were designed to only work with Kirk plates. You cannot interchange the two. Wimberley plates are designed to work with both older RRS and Kirk screw-mount flash brackets, as well as our own quick-release brackets. 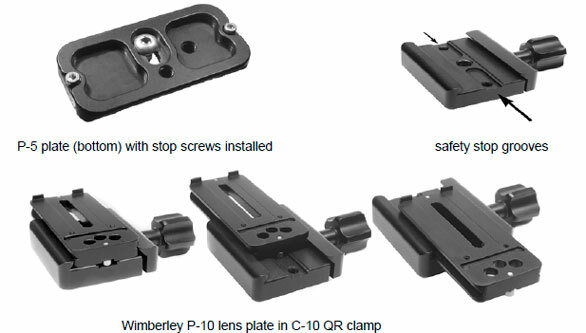 Wimberley plates have a unique double dovetail cross-section that allows you to attach Wimberley's quick-release flash brackets to the upper or lower surface of the plate. Wimberley’s QR flash brackets attach with a low-profile quick-release clamp, thus eliminating the need for loose screws and special tools. Kirk and RRS among others have adopted our quick-release design and this design is now becoming the industry standard for flash brackets. Note: if you will be using older Kirk brackets, you must install two special screws that are included with the plate. The ends of these screws serve as nubs that keep the bracket from twisting. This is not as elegant as an anti-twist slot milled directly into the plate, but it works well and makes the plate more elegant for all other applications. RRS and Kirk generally make custom plates for specific lenses. We admire the work and dedication that they put into custom fitting every lens, but we have a different design philosophy. A custom plate means that you have no choice as to what size plate to use or where to position it. RRS and Kirk make this decision for you. We believe that it is better to offer universal plates so that you have a choice of what size you want and where you want to position the plate. Because our tripod heads require precise positioning and balancing of a lens, we have an extensive knowledge of lens balance points. The balance point of your lens will vary with the camera body. It is also affected by the use of battery packs, teleconverters, extensions tubes, and flash brackets. It is important to be able to get a plate that is long enough and that can be positioned in the proper place so that you can balance your lens under all circumstances. Our plates have slots that accommodate multiple fasteners and a wide variety of fastener positions. This allows you to orient the plate on the lens foot in a way that best fits your needs with regard to the center of gravity of your rig and the location of your flash brackets. Because the plates are universal, you do not necessarily need to buy a new plate if you switch to a similar sized lens. Furthermore, you can generally use a plate that is longer than the one we specify. This is not, strictly speaking, a feature of our plates but it is important. RRS and Kirk accept returns only on unused items. We recognize that you cannot determine whether you like a product until you have used it. Our money-back guarantee is valid regardless of any use, wear or damage done to the item. We realize that quick-release plates are very expensive, and we feel it is our responsibility to make sure you have the ideal plate for your lens. If, within the first 60 days after your purchase, you are at all unhappy with your Wimberley products, you can makes exchanges, or return for a full refund. We also have a US valid Test Drive Program, that allows you to try out any new plate before you buy it. We must have a valid credit card number in order to loan a product, but we do not charge anything to the card. The Test Drive period is 2 months.